A two week sail through the Abacos with our 7 and 8 year old sounded like the ideal vacation this summer. This would be our first family cruise on a newly completed Shuttlecat 32, the Eagle, designed by John Shuttleworth and built by my husband, Dale Schneider, for owner John "Bugsy" Buglione. What could make it even more perfect for a non-sailing, working mom? That would be bringing along a professional captain and the children's Danish nanny, Birdie. While nanny tended the children, John and Daisy, mom rested into oblivion, got to know hubby Dale again, and Captain Jimmy navigated, sailed, anchored, and best of all, cooked the fish and conch he had only moments before caught. Cruising for me has in the past been a traumatic and seasick experience, so I was not expecting the best of times. Don't ask me why my sailing fanatic husband married a non-sailing bride. Perhaps when he described to me his ambitions of building fast cats I didn't quite understand that he was serious. 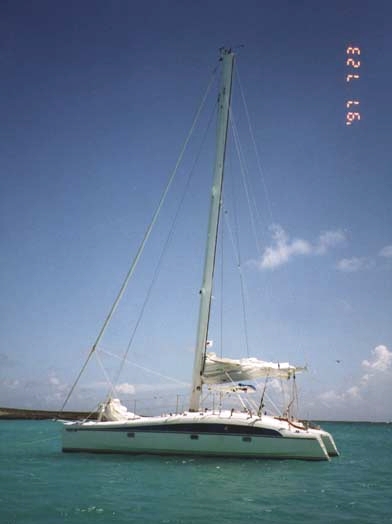 Even so, I was involved in selecting our designer, John Shuttleworth, from the beginning when we met him at the 1988 MULTIHULLS symposium. I was impressed with his advanced thinking and his ability to convey the thought behind his designs to an amateur such as myself. Marrying a sailor and choosing a good designer does not make a sailing wife automatically. I can say after this summer that I am now smitten with cruising aboard the Eagle and look forward to many more adventures in the future. We left Ft. Lauderdale in a light rain this summer just after sunset. As we crossed the Gulfstream toward West End, Grand Bahama, I rested on the nets and caught up with Birdie, who had flown in from Copenhagen. She had been our nanny six years earlier when the kids were just babies. The crossing was smooth and the skies cleared to reveal a "touch the stars" ceiling. We arrived just after dawn to check into the Bahamas. My relaxation had officially begun. I felt great. Captain Jimmy Sanderson knows the waters of the Abacos well, having sailed the outermost islands of the Bahamas chain many times. We left West End and rounded Mangrove Cay headed for Grand Cay and Double Breasted Cay. Winds were light but the Eagle sped along smooth as a glider. We stopped and dove a plane crash at Mangrove Cay and dropped anchor for a fresh fish dinner. We remembered why not to anchor near mangroves when the mosquitoes found us. Rather than sweat it out, we set sail around 9 pm and were met with a midnight summer squall with winds reaching 25 knots. We were flying along at 13-15 knots perfectly smooth and level. The children, John and Daisy, read us the instruments, gave navigation advice, and enjoyed the thrilling ride. Nanny and I glistened in the breeze while my onshore life as a housing planner evaporated into the night air. We listened to Captain Jimmy singing pirate songs to the kids... "we may be ugly, but we know the seas..."
We motored into Grand Cay and took the zodiac to shore for the children's first visit to a foreign country. On this, as on all of the cays of the Abacos, Daisy made friends quickly with the Bahamian children and the islands dogs and cats. I was impressed with the public works efforts to pave golf cart paths, the water tower and the sparkling new city hall. We feasted on a lunch of cracked conch and Kalik beer. We explored the bayous of this rocky island in the zodiac and then headed out to anchor outside of Double Breasted Cay. Another feast of conch and fresh grouper was finished off with a long swim in the bath-like Bahamian blue water. Comfort and privacy were never a problem on the Eagle, even with six people - four adults and two children. The captain enjoyed the privacy of a forward port double bunk big enough for his 6'3" lumbering frame. He even brought along a wine cellar that fit nicely into the cubbies I outfitted with removable mesh pouches. These can be carried directly to the laundry if desired. Nanny also had a private stateroom in the forward starboard hull. Mom, Dad, and the kids shared a giant size bunk in the starboard aft. On some nights one or more of us slept out on the nets under the stars. The boat is outfitted with Lewmar hatches and screens which gave protection when the nosee'ums and mosquitoes found our anchorage. Perhaps the most amazing comfort for me was the ample electricity available from the solar panels mounted on the T-top. Lights burned in all quarters, fans were on, my laptop computer (fun only- no work) ran, as well as all of the instruments and lights without ever a flicker. Dale and Jimmy commented frequently on how the batteries stayed fully charged, and only dipped a little after a high energy night. The galley was big enough for Jimmy, Birdie and I to cook gourmet meals like Jimmy's "spare no expense on the sherry" conch chowder. The two burner propane cooktop and the broiler worked well and we enjoyed toasting slabs of Bahamian bread to top with mango preserves. We dined in the galley around the large settee if it was raining, but mostly dined alfresco at the large fold-out table in the cockpit. Cleanup was no problem with the salt and fresh water faucets in the sink. Fresh water showers were enjoyed everyday by everyone. The T-top was fitted with hose fittings with removable pipes that refilled our fresh water supply with a good summer afternoon shower. We rarely thought of rationing water supplies. We sailed the entire Abaco chain, from the Double Breasted at the north, weaving in and out of the deep blue offshore waters and the inside, island dotted flats to our final destination of Marsh Harbor on Great Abaco. While deep sea fishing one day we were overtaken by dozens of dolphins who gave the kids the show of their lives. I can still see Daisy flat out on the nets, her tiny fingers almost touching the cresting dolphins. We tended to sail with the genoa during the mornings and just the main and jib in the afternoon when the thunderstorms were likely to join us. The self tacking jib and wingmast made the captain and mate happy, but the autohelm was especially appreciated. Captain Nobody, as we dubbed the autohelm, allowed us the freedom to tend the fishing poles, refill refreshments and generally relax. The bar tiller across the stern was convenient from wherever you might be to steer. A great fish cleaning bench was built onto the back of the rear crossarm. When Johnny started his "bait collection" it was relegated to this post as it tended to ripen quickly. It was also a handy place for diving gear and loading into the dinghy. Steps built into the hull sterns made getting in a out of the water a cinch. The kids enjoyed sitting on the steps while underway, sufficiently tethered of course. While we tried not to focus on land based adventures too much, we had many enjoyable visits to get fresh bread and ice. At Coopers Town we returned to the boat just as a storm blew in. The main sail had partially hoisted itself up the mast and the boat was sailing into the dock. We pushed off in haste and the Honda 25 four stroke did the job of backing us away just in time to avoid any damage. One of my favorite features of the boat was the kick up rudders and the very shallow draft of the Eagle. This allowed us to venture right up to the beach for swimming and snorkeling. Moraine Cay was one such pleasure. We swam the length of the staghorn reef as a family unit, with the dingy in tow in case someone tired. No one tired on that dive, but on another I was glad to have the dingy tied to my waist. Jimmy had just speared a grunt and tossed it into the dinghy when a reef shark suddenly confronted us in a "where is it?" panic. I wasn't as alarmed as I should have been, but being convinced that a shark's brain activity is somewhat like a dial tone, I made a failed attempt to heave myself into the dinghy. The second try worked and Jimmy made it in also. Laughing, Jimmy winked that every time he catches a fish in the Abacos he gets chased out of the water by a shark. Very funny. One of our longest island visits was Guana Cay. We had our only misadventures on this island, even though it was one of our favorite places with its spectacular beaches and famous Guana Grabber tropical drinks. One night, we were snug at anchor in the small harbor when a 60 foot yacht began to drift to shore. We blew our horn but no one stirred. By the time Dale and Jimmy reached the boat by dinghy and woke someone up, the only message to tell them was that they were on the beach. By low tide the huge boat lay grotesquely on its side. Islanders helped through the night and by morning's high tide pulled her off. The other mishap occurred another evening when we were out walking along the pathways of the island. Daisy balanced on a little concrete kneewall and slipped on a crack. She didn't tell us she was hurt until much later when we returned to the boat. As I was putting her to bed she showed me a two inch gaping cut on her inner thigh. Stitches were mandatory. Jimmy and I dingied into shore and began knocking on doors. By now it was midnight and an islander in a golf cart took us to a nurse's home. She had no equipment but said there was a good doctor at Treasure Cay, about 12 miles away. He would have morning hours she told us. I patched her up with butterfly bandaids and guaze. We anxiously awaited daylight and motor sailed to see the doctor. An American, Dr. Wilson keeps a practice for the resort community of Treasure Cay as well as many Bahamians on that part of Great Abaco. I was amazed when I reached him personally by VHF radio just after daylight. "Bring her in," he said comfortingly. After nine stitches and still no tears, Daisy was rewarded with a teddy bear. Sadly, for the last three days of our vacation, she wasn't allowed to swim. She managed to "wade" quite a bit without losing too many bandages. I flew home with the children from Marsh Harbor as it was time for me to get back to work. The children and nanny had the time of their lives. For Birdie, it was her first experience sailing and first blue water. By the time we left she was knowledgeable of many of the boats systems. And I was sold on the comfort, speed and security of a well designed catamaran. I have no idea why I never felt seasick. Perhaps the design for smooth motion along with a real effort to enjoy this lifestyle helped me get beyond this. Having a paid professional captain along, as well as a trusted nanny, certainly shaped this perfect vacation into an entre' to become a sailing mom.